Why securing latent prints contactless? Today, forensic experts and crime scene technicians can avail of a number of methods to secure latent fingerprints on exhibits. The application of chemicals has proved worthy for different types of surfaces. Thus, powder, Cyanoacrylate, Ninhydrin, Indandione etc. are part of daily routine at the crime scene as well as in the lab. After the traces have been made visible, in most cases they are physically separated from the exhibit (film take-off) and/or taken a picture of afterwards. Despite the difference of the tested and dependably functioning methods, they all have the same disadvantage. Traces and exhibits are inevitably affected or changed negatively. The exhibit might not be available any more for other testing methods like DNA-analysis or – what is certainly possible – for future improved procedures. EVISCAN – a potential Solution? German eForensics GmbH has developed the first market ready device for a contactless and chemical free detection, electronical preservation and documentation of latent (finger-) prints on non-and semi-porous exhibits. Contactless – in the case of EVISCAN that means no danger of contamination due to touching or contact with chemical substances. The lab device combines IR-technology and a special image enhancement software to an optical-physical analysis method which requires no prior treatment of the exhibits. 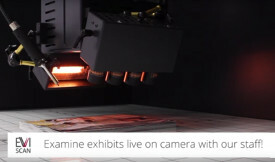 The integrated scan unit differentiates between background and trace based on the different characteristics of reflection and absorption of invisible IR of the exhibit and the trace residues, not based upon the well-established methods which refer to the observation of contrast by the human eye. 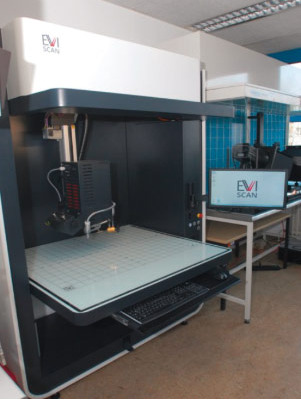 In theory, this is an approach with great potential: EVISCAN can consolidate the latent print detection in one digital process and make it a repeatable procedure with reproducible results. Another aspect seems even more important: Exhibits and latent print evidence remain in their original condition. Thus, they are available for further analysis without restriction. However, how useful is that method in real life and does EVISCAN help at all in the daily life of a criminal lab? The State Office of Criminal Investigation of Rhineland-Palatinate avails of comprehensive experience regarding the preservation of latent print evidence. Between Dec 1st, 2014 and March 23rd, 2015, an intense evaluation project of the EVISCAN technology was performed in their lab. The goal of the project was to test and evaluate the new EVISCAN technology in the real life of daily lab routines. The most important issue was to test the reliability of the new method with regards to the success of detection of traces and the quality of its graphic representation as well as the demand of resources in comparison to the established methods. Also, potential advantages and disadvantages should be determined and impulses for further developments of the technology should be generated from the real life application. 3) University Bonn-Rhein-Sieg (Department 5, Forensic Science, Prof. Dr. Richard Jäger), responsible for the scientific part as well as gathering data for a proprietary neutral profitability report. During the whole time of the project, EVISCAN was located at the forensic lab in Mainz and thus available for the daily jobs of the preservation of evidence. For the analysis, the responsible investigators picked suitable exhibits from their daily work which had non- or semi-porous surfaces and appropriate geometry and surface appearance. All further exhibits of this study period were not considered for this project. The opposing analysis of exhibits with EVISCAN vs. conventional methods were documented in detailed continuing protocols. In doing so, the methods were assessed separately and individually based upon predetermined assessment scales according to objective criteria. Also, the subjective impressions of the team were retrieved by dint of a structured interview at the end of the project. In the run of the project, the handling of all exhibits was carried out with the same approach and sequence. Always the first step was the analysis by EVISCAN because this procedure leaves the exhibits in their original condition. EVISCAN fist localizes and detects latent prints. Immediately, those are enhanced and saved digitally applying the built in image enhancement software. 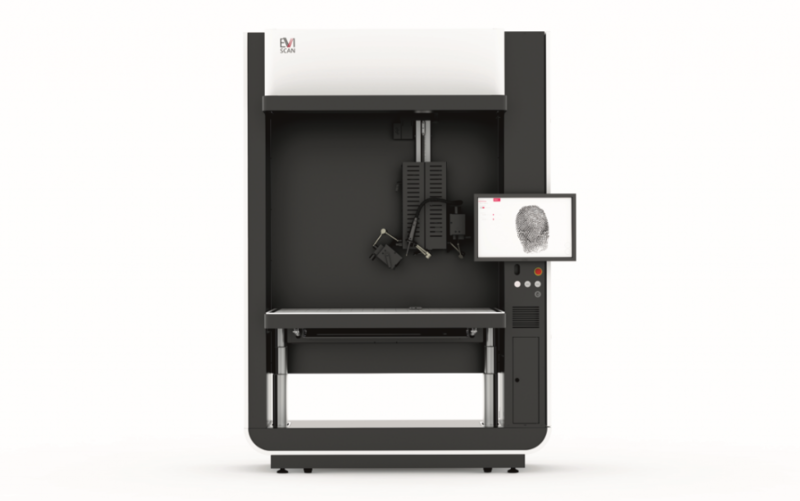 At this point of time, the saved latent print can be used for automated fingerprint identification (AFIS) or further analysis. The second step was the analysis of the exhibit with the conventional methods, i.e. fuming with Cyanoacrylate, where applicable contrasting with adhesion methods or basic yellow. Afterwards the found latent prints were photographed and enhanced. Altogether, in the run of the project 90 different exhibits from 44 cases with varying geometry, surface conditions and materials e.g. plastic bags, glass containers, mirrors, glossy paper or weapons were analyzed. Of course, this is not a reliable amount to draw general conclusions regarding the validity of the procedure. However, comparing the procedures, tendencies can be deviated. At 90 analyzed exhibits, with EVISCAN 21 latent prints were successfully secured, with the conventional methods, 22 latent prints. Thus, the procedures do not differ in the probability of proof with regards to the surfaces materials. However, with these preservations of evidence, EVISCAN was able to secure 78 latent prints whereas the reference procedures secured 18 fragments, which are not usable for latent print analysis today. With appreciation to the findings in these exhibits, the EVISCAN technology seems to be able to secure latent prints contactless and without any chemical or adhesive pre-treatment, often in the same, sometimes even better quality than the reference procedures. 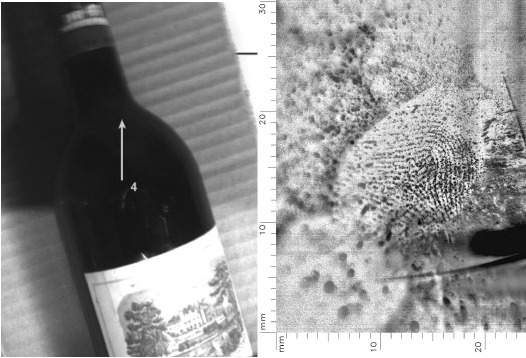 In the case of pre-treated exhibits where the securing of latent prints has already been carried out and only the photographic documentation was necessary, both procedures were equally effective. Thus, EVISCAN can take over the photo-documentation of CA-fumed latent prints as well. In one special case, EVISCAN was able to convince particularly. 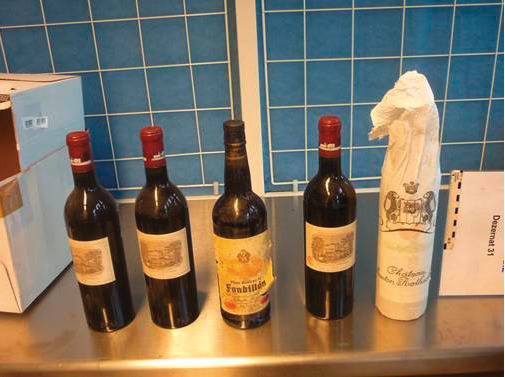 It was possible to secure analyzable latent prints on stolen wine bottles with a very high collector´s value. Those let to the identification of the person responsible. Treating these exhibits with conventional methods was not an option in this case. The fuming with Cyanoacrylate would have included a danger of damaging the rare collector´s pieces. However, EVISCAN has made a successful, non-destructive analysis possible. The time factor plays an important role when evaluating the effectiveness of the single processes. In this connection, the difference between processing time and throughput time has to be made. In this evaluation, the processing time is the pure working time of a team member without any waiting time due to procedure or resources. The throughput time, however, also encounters delays due to the procedure but not due to resources (like work overload, shortfall of team members, holidays or weekends). With regards to these aspects, both procedures have advantages as well as disadvantages. EVISCAN´s all-in-one-principle was more efficient with smaller and mid-sized exhibits. All steps of the process – starting with the detection of the latent print up to the digital documentation – are done at one work station and don´t require any interruption. This was different with the conventional method. Here, the chemical pre-treatment, the residence time as well as photographically securing the latent prints always required delays. Also, the analysis of the results is in the responsibility of several work stations and team members. The conventional methods had advantages with large-area exhibits like shopping bags or a few exhibits with the same surface. Here, the manual scanning of EVISCAN was more time consuming because each exhibit had to be scanned singularly and examined in detail while the Cyanoacrylate fuming could treat some exhibits at the same time. Summing up, one can conclude for the project that the conventional methods had advantages in the processing time. 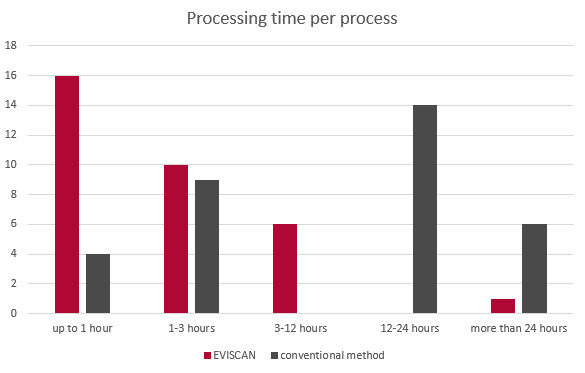 However, EVISCAN was more effective regarding the throughput time. Throughout the whole phase of the project, at least one employee of German eForensics was available either on-site or directly accessible. Disadvantages which were recognized in the daily routines could have been directly communicated and documented. The identified demand for development of EVISCAN as well as the new impulses involve enhancements both in hardware and in software. Some of those were already implemented during the phase of the project or available shortly, according to the information of the company. Thus, the experienced comfort of handling should be improved. This is especially interesting with regards to the negative impression due to the long processing time of larger plastic foils. One finding of the project was for example that the practitioners in the lab would like an automated preview on larger areas in order to shorten the processing time. Thus, the first long-term operation of the technology at practice requirements were able to give concrete impulses for further development as well as valuable feedback for the developing company. 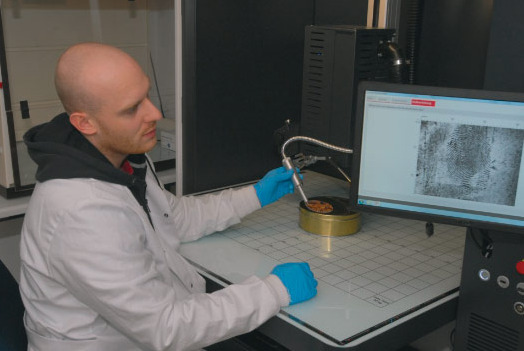 The project has shown that EVISCAN is a very good alternative and/or complement for the daily jobs of forensic science labs in the preservation of latent print evidence. Even though some items were better suited for treatment with conventional methods due to their size or material, EVISCAN was able to keep up with the proved conventional methods or even show its advantages in a few cases. What´s quite notably, is the preliminary result that the EVISCAN method was able to secure more latent print fragments than the reference method. This experience is only proven by a small database. However, there are at least some doubts regarding the correctness of the presumption that the methods which have been applied so far were able to completely detect all existing latent prints. Also, the exhibits treated with EVISCAN were untouched by the investigation. Thus, ideally it is possible to keep the exhibit in its original condition. If new methods will be available in future, further or new findings can be won and/or the results can be reproduced. In the absence of adhesive or chemical agents it is possible to reduce the impact of harmful substances and in a lot of cases, EVISCAN can replace conventional photography to secure the latent print detections, too. Already right now the author has no doubt that this new technology will add additional value for the future preservation of latent print evidence and its application in bigger forensic science labs is conceivable. From a professional point of view it would be desirable to verify this preliminary result with further examinations, a greater database and developed technology in order to provide this method with regular assignment in forensic science. You can find the original version (in German) here. Previous Post: Damage or destruction of latent prints on an exhibit – a real life problem!? Next Post: Confront EVISCAN with an exciting Challenge! 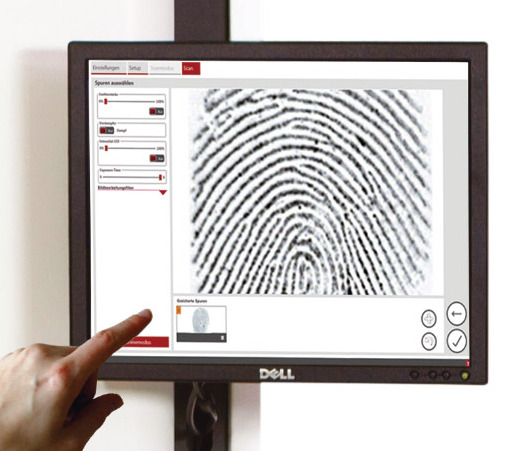 Experience how EVISCAN processes latent fingerprints on your desktop!